That included cataract surgery to restore her vision, but sadly, post-operatively she developed retinal detachments, leaving her blind once again. However, it didn’t affect her spirit at all. To this day, whenever we bring Mildred inside after being outdoors for her potty breaks, she twirls on the floor, spins around, and does a couple of play-bows. It’s just so endearing to see this joy and playfulness in a little blind senior (and one who’s almost completely deaf, by the way!). But she’s going in for surgery this week. One of the things we discovered during her medical work-up last fall was a biliary mucocele, in which her gallbladder is retaining excess mucus. Our internal medicine specialist at Peak, Dr. Marielle Goossens, has been managing that condition with medications. We periodically do repeat ultrasounds to look for changes in the gallbladder. Unfortunately, at Mildred’s latest ultrasound a week ago, we found her gallbladder had deteriorated further and it’s now time to have it surgically removed. If we don’t, it can rupture internally and create an immediate, life-threatening danger to her. So our board-certified veterinary surgeon at Peak, Dr. Kurt Schulz, will be doing the operation. Mildred will be in the hospital for a couple of days post-surgery. She can function just fine without a gallbladder, though we will need to continue to closely monitor her liver function. Needless to say, we’re going to be nervous wrecks until she’s safely out of surgery. Given her advanced age and heart condition (she’s on heart meds, too), there are risks … but we’ve discussed them with Dr. Goossens, and the biggest risk is to do nothing and end up with an emergency situation where it might be too late to help her. So please keep Mildred in your thoughts this week. Thank you! 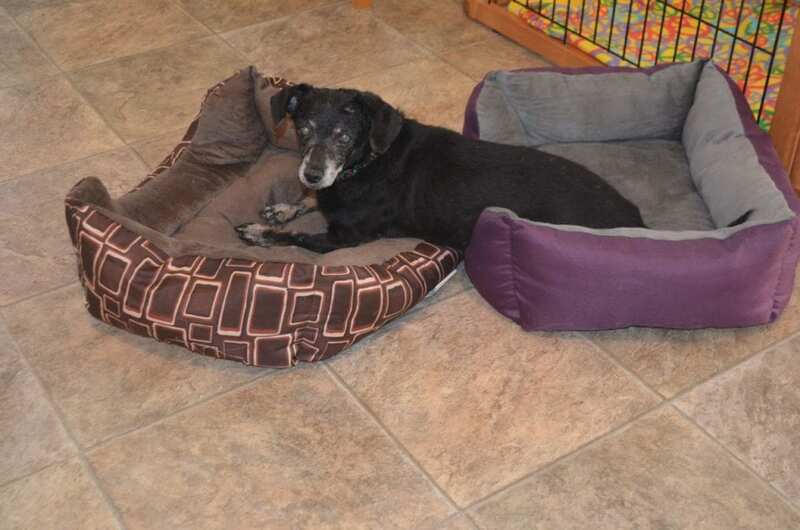 Even though she’s blind and deaf, she obviously knows you are there, admiring her ability to use two beds at once. It’s great that she’s such a happy girl. I’ll be thinking good thoughts for her while she is having surgery! I love your posts, humor, and drive . Hoping for best outcome for all. She’s such a sweet old lady. Love that bed photo. Hoping she does well with her surgery and enjoys many more years with you guys and all her doggie friends.